The Library Overview Window is accessed from the File menu, or -B, and provides an overview of one or two of your libraries. On the left is your local (usually iTunes) library. On the right is the Remote library, if open. Hover over any statistics and you'll see a description of the filter, how many matches there are, and how many tracks can be synchronized. Click on a statistic and matching will be displayed in the main window. The Get, Put and Sync buttons will be updated to work on the tracks visible in the Main Window. Before doing synchronizing, we recommend you Analyze and Repair your library and Remove Duplicates. 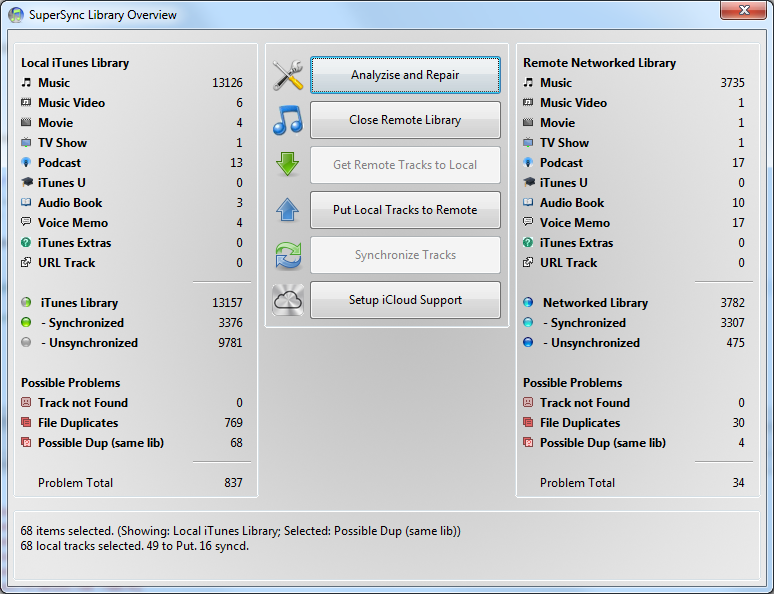 Analyize and Repair lets you scan your local library for tracks that are missing and broken tracks. Close Remote Library lets you quickly close a library, so you can compare and merge a second library. Get Tracks - Gets unsynchronized Remote tracks that are displayed in the Main Window. Put Tracks - Puts unsynchronized Local tracks to the Remote library from the Main Window. Synchronize Tracks - Gets and Puts unsynchronized tracks. Cloud Setup or Cloud Overview - are for users of iTunes Match users.